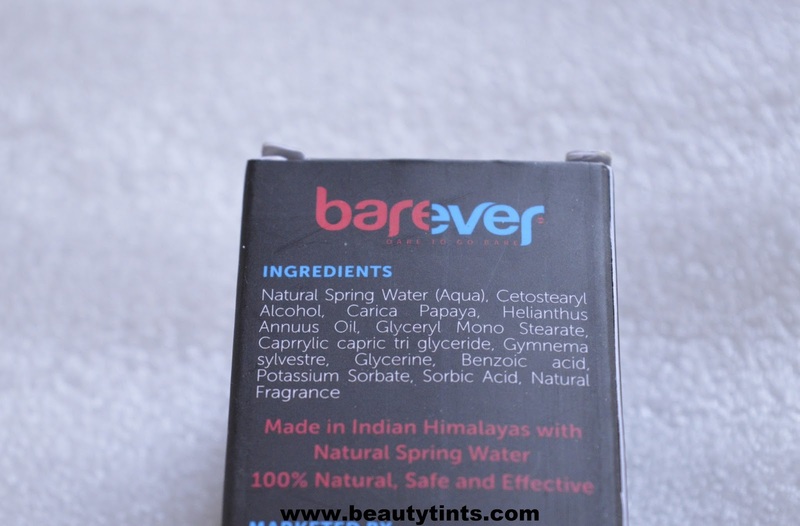 Sriz Beauty Blog: Barever Natural Hair Inhibitor Review!!! 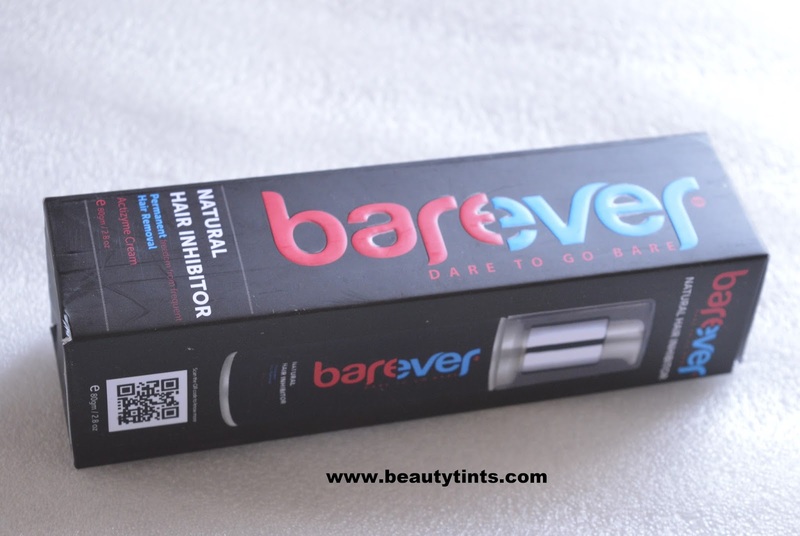 Barever Natural Hair Inhibitor Review!!! Today I am reviewing the Barever Natural Hair Inhibitor,which helps in slowing down the unwanted hair growth on face, legs,Hands etc., It is safe to use on Face,Legs,Arms and Bikini Line. Packaging : It comes in a sleek black colored bottle with a pump tube,with in a similar colored outer carton. What the product Claims :Barever is a Natural Hair Inhibitor and it works in tandem with your hair removal methods as the follicle pores are opened during that time which helps better penetration into the skin. The potent formula of Barever seeps into the opened pores and reduces hair growth by inhibiting the activity of hair follicle cells. Acting at the Anagen stage of active growth phase for hair follicles, Barever first slows down the formation of new hair at root level and then reduces the density and thickness of hair. It gently stops the growth of hair by naturally making them weaker, thinner and finer and results into a soft, silky and smoother skin for longer period. After using barever together with 3 sessions of your hair removal method, you will start noticing the results with the reduced hair growth. As far as safety is concerned, you will be delighted to know that Barever is formulated with ingredients derived from plants which make it 100% Natural, Safe and effective. 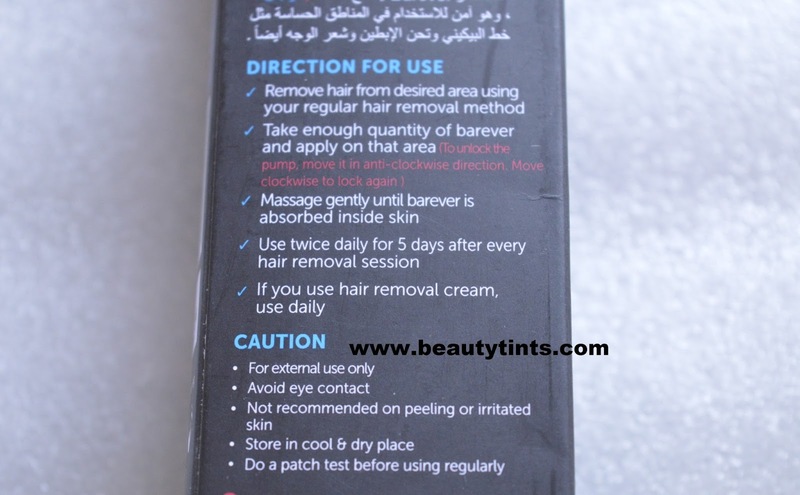 The only side effect which you will have with Barever is that body hair growth will be reduced but that is also the main effect for which you shown trust in Barever.Barever should be used just after your current hair removal method for twice a day for next 5 days or until the sight of hair growth on the skin. Barever works best with your all hair removal methods which remove hair from the root like Hair Removal Cream, Waxing, Sugaring, Threading or Laser Hair Removal. Color and Texture :This is a pale white colored soft cream. Availability : You can buy it from here and here. Ingredients : Natural spring water,Cetostearyl Alcohol, Carica Papaya, Helianthus Annuus Oil,Glyceryl Mono Stearate, Caprrylic capric tri glyceride,Gymnema Sylvestre, Glycerine,Benzoic Acid,Potassium Sorbate,Sorbic Acid,Natural Fragrance. Directions For Use : 1. 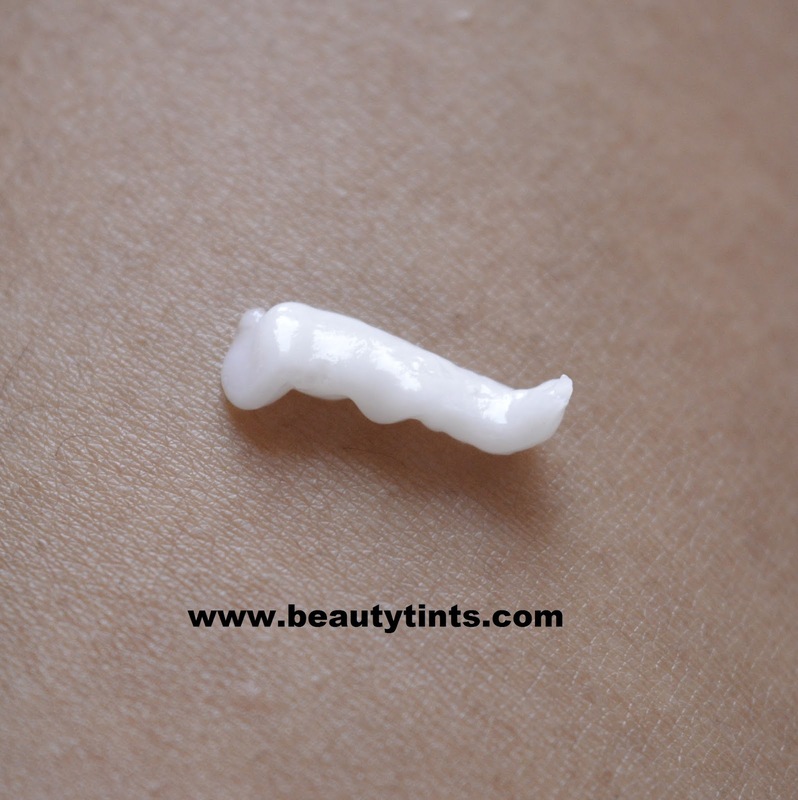 Remove hair from desired area with your regular hair removal method. 2. Take enough quantity of barever and apply on that area. 3. Massage gently until barever is absorbed inside skin. 5. 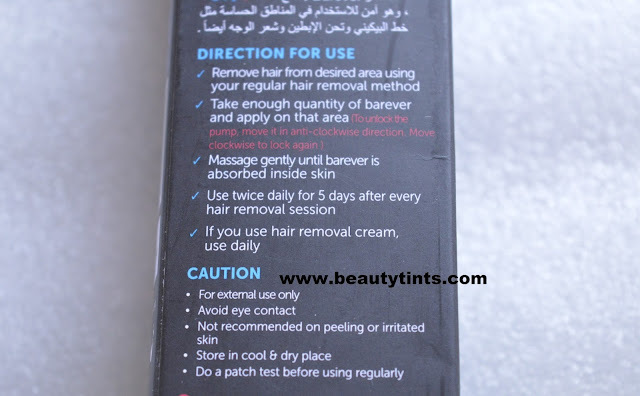 If you use hair removal cream then use barever twice daily. Repeating the same exercise with every next hair removal session, you will notice that hair growth has reduced significantly and the need for your next hair removal is delayed. Eventually, the continued use of Barever shall result into permanent reduction of hair growth setting you free from the life long battle with hair growth and frequent hair removals. 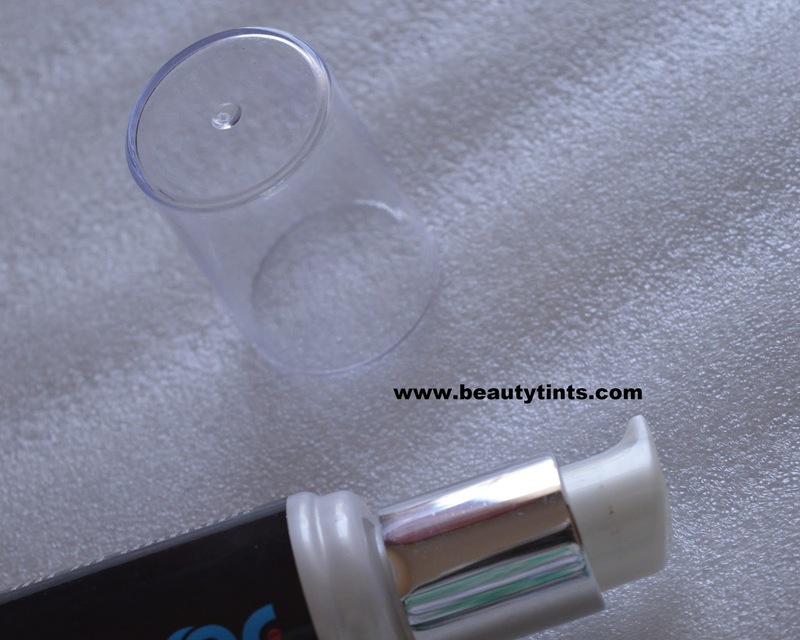 My View On the Product : This Barever Natural Hair Inhibitor comes in a sleek black colored tube with a pump dispenser which dispenses the right amount of product,with out any wastage and it also has a locking system which makes it convenient during traveling. The cream has a mild fragrance.The cream is off white colored and has a bit of thick consistency.It gets absorbed easily with light massaging and it moisturizes the skin for long hours.I have used it for more than 7 times for now for 5 days after my waxing sections and this definitely helped in delaying the re-growth of the hair as well as in reducing the thickness of the hair.Usually my hair starts growing in 12-15 days after waxing,but after using this,it started growing after 25 days when used for first time and after using this cream for a couple of more times, it eventually delayed the re-growth of the hair and also reduced the thickness and firmness of the hair,as a result,the new hair that grows is soft and thinner when compared to before and now I am going for waxing only once in every two months and even longer than that.I have used this only on my body hair but not my face,as this is a bit thick cream,it made my oily skin a bit more oily.So,I stopped using it on the face,but if you have dry skin,then you can happily use it on the face,as it is safe to use it on the face. This cream is enriched with the goodness of Natural spring water,Carica Papaya,Helianthus Annuus,Glycerin and the one ingredient which reminded me that I am a biotechnology student which is the Gymnema Sylvestre,which is the plant on which I did research for 1 year to test for its anti-cancerous activity.I am really glad to go back to those days and special thanks to this product for reminding me about that.And coming to this product it is priced at INR 1100,which seems pricey but when comparing it with the price of each waxing section as well as to those costly laser hair removal methods,it is quite affordable.Though I got the first bottle as a PR sample but I bought the 2nd and 3rd bottle with my own money.I am very happy that I found an effective as well as a safe solution,that can help in reducing the unwanted hair to a great extent!!! Final Conclusion about Barever Natural Hair Inhibitor : This Barever Natural Inhibitor is one of the best and safest methods that extends the hair re-growth time and also makes the regrown hair soft and thinner.It suits even sensitive skin!!! Suganda Coffee Avocado Body Polish Review!!! Aroma Essentials Neem Face Wash Review!!! Get The Fastest Network Ever With Airtel 4G!!! 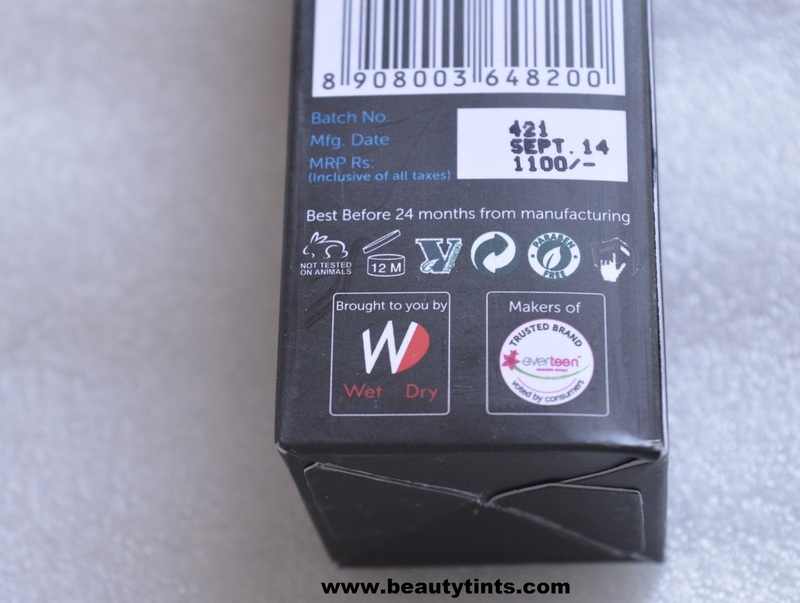 My Envy Box August 2015 Edition Review!!! Melange Pasta with Del Monte #ItalianEscapades!!! My Brother Is My Best Friend #MySiblingRocks!!! W2 Pomegranate Face Pack Review!!! Sand For Soapaholics Deadly Face Mask Review!!! Aroma Essentials Black Magic Face Pack Review!!! MSM Express Box August Edition Review!!! TE-A-ME Teas Renew Honey Lemon Green Tea Review! Latest Fashion Trends, You Must Try!!! Bio Bloom Dandruff Control Hair Oil Review!! !